Is your iPhone 6s Plus broken and looks past it's best, we offer a complete iPhone 6s Plus refurbishment service. We will replace your iPhone 6s Plus screen with a brand new one, install a new battery, a new rear case, transfer all your other parts to the new metal rear case and finally install a new SIM card tray, power button, volume buttons, and mute silent switch. Once complete our iPhone 6s Plus refurbish service restores your iPhone 6s back to its former glory as if it was brand new. * Our normal repair turnaround times are 3-5 working days unless parts are to be ordered. We always aim to complete repairs as fast as possible. 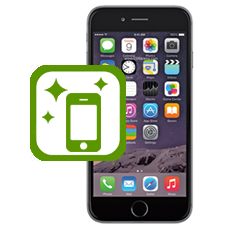 This is an in-house Apple iPhone 6s Plus refurbish service, when ordering this service you are required to ship your iPhone into our repair centre for works to be undertaken.